A very good mole, slightly, in my opinion, not sufficiently tight to its age, the aroma is the closest - diverse and complex, the harmonious fusion of the barrel and the base; taste / finish, with all the pluses, still correspond to the years 20-22, fairly simple and straightforward, but overall - very tidy, well-balanced, soft, despite a good strength, sweet lemon-oak summer whisky. Open, wet, freshly processed wood, leather goods, pipe tobacco, lemon peel, carpentry workshop, thinner, light creamy confectionery notes, grindstone, stone dust, orange, vanilla, grain tones. 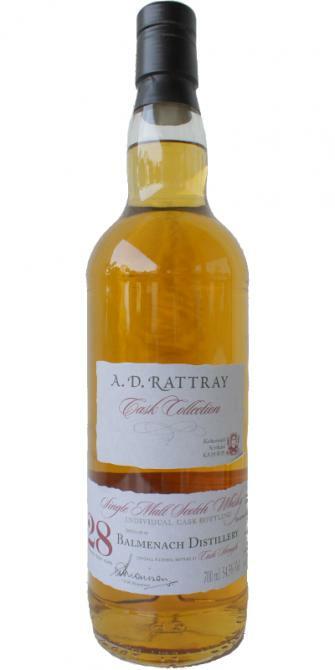 Oily, powerful, sweet-oak, a little red pepper, lemon, orange jam, light herbal medicinal notes,? Tarhun ?, Over time, flowing flower-honey motifs, sometimes reminiscent of Klineish. much alike indeed. And hence the same score. Thanks, Michiel & Mireille! taste the malt in this one. A very good nose, which raises the expectations on the palate every minute. Even there he is by no means weak, but not quite so convincing. The finish does not have to hide and leaves a really good overall impression. My tenth Balmenach. Only one so far would have been better suited for this little anniversary. First of all a good momentum malt, accompanied by a pretty meaty note. The amount of wood, which comes through again and again is audible, but discreet and very pleasant. In between, always memories of rather dry forest soil and soil. The latter remind me a bit of slightly advanced Talisker in old age, though certainly more restrained here. Citrus aromas and traces of honey are rarely, but always heard. Beautiful, balanced nose, which highlights the high degree of maturity of this Speysiders. Again, it is first of all a decent portion of malt, which pervades, detached from strong, gently bitter impressions, a powerful spicy way down the palate. You do not have to dilute here. A touch of Mon-cherie cherry in the midst of a well-reverberating powerhouse, which looks more youthful here than in the nose.